Memorial Day is a genealogist’s Christmas, truly. It’s a time when we honor our ancestors by decorating their graves and also a very important time to recognize our military. The day was established after the Civil War to honor the dead. I struggled with this weekly theme. Both of my uncles (my mom’s brother and my dad’s brother) served in the United States Army. My own dad served in the National Guard, but my grandparents, Elzie and Vera Chenoweth, made a great sacrifice in the name of military also. They served in a unique way. It started in the spring of 1941. We would see strange cars going up and down the road. Some of our neighbors said they saw “US” written on the cars. This went on all summer and we all passed anything we heard back and forth. The in the fall, we saw men surveying for the roads and the sewers that ran under the roads. But you couldn’t get anything out of those guys. They wouldn’t tell you anything. Then one day, Elzie (my grandfather, Elzie Chenoweth — pictured above) went to bale hay at the neighbors, and he told everyone that he’d heard we were going to get a camp because he’d seen them unloading cats. Well, everybody thought he meant “Cat” tractors, bulldozers, but after they questioned him, he jokingly said it was “tomcats”. Next thing, those men came to our house and asked Elzie to walk the farm with them. They’d asked different questions and every once in a while, they’d scribble something down, but they wouldn’t tell anything either. By the Spring of 1942, we had rented a Macomb farm, afraid they’d build the camp and we wouldn’t have any place to go. Then we saw water towers being built between Ipava and Table Grove.We’d get up to milk in the morning, and we’d see the lights over by the water towers where they were working. Then they started building some long storage sheds, and by September, the government had purchased 8,500 acres of surrounding farmland. By the 10th of September, before the corn had even matured, they brought in bulldozers and plowed up the fields, corn and all, and were getting it ready for building. We got a notice on February 1, 1943, that we had to be off our farm by March 1, 1943 — a month from then. We didn’t now where we were going to be. So we had a sale. Our sale was on Friday, February 26th. Things sold well. People came from everywhere, because all the neighbors had to sellout, too. We had a rubber-tired truck, built for us by Cecil Wright for $65 early in the year, and it sold for $200. Woven wire fences went for $1 a rod. We had to get our hay and straw out of the barns, because they were going to tear them down. On Saturday, the 27th of February, one day after our sale, we had read bad weather, a blizzard. We had planned to move that day, but didn’t know what to do. Our boys weren’t old enough to help a lot. Our oldest son was only twelve. But Elzie’s brother and Oliver Smith came and helped us move that day to Macomb. On Sunday, the government workers were in, tearing down our barns and letting the boards fall on our horses and tractor that we didn’t have moved yet. While it was going on, lots of newspaper men came in to do stories on the new camp. People in Macomb thought it was great. I was going to improve business for them. Everyone around us told us to fight it, but we went to Illiopolis, and talked to them and decided it wouldn’t do any good; just one man fighting the government. When we were moving, it was every neighbor for himself. Normally neighbors would hep each other, but all of us were moving. Some folks closed up farming; some went to farm somewhere else. On July 4, 1943, they had an open house at Camp Ellis. They said there were 8,000 soldiers at the camp … on land that used to belong to us and our neighbors. There are a few notes I need to add to Grandma’s writing. First, my Grandpa Elzie was a big joker, so it was not surprising to hear he had tricked the neighbors with his cat joke. Cities mentioned in this article are all in Illinois . Macomb is in McDonough County. Table Grove and Ipava are in Fulton County. Illiopolis is near Springfield, IL. When Grandma mentions the neighbors, she is really talking about her extended family. The Chenoweth and France family had lived and owned farm land in this neighborhood since the 1850’s. My father was the 5th generation to live in the house on the farm. The house was torn down when the camp came in. “Elzie’s brother” refers to Harry Chenoweth. Oliver Smith was a cousin to Elzie on his mother’s side. 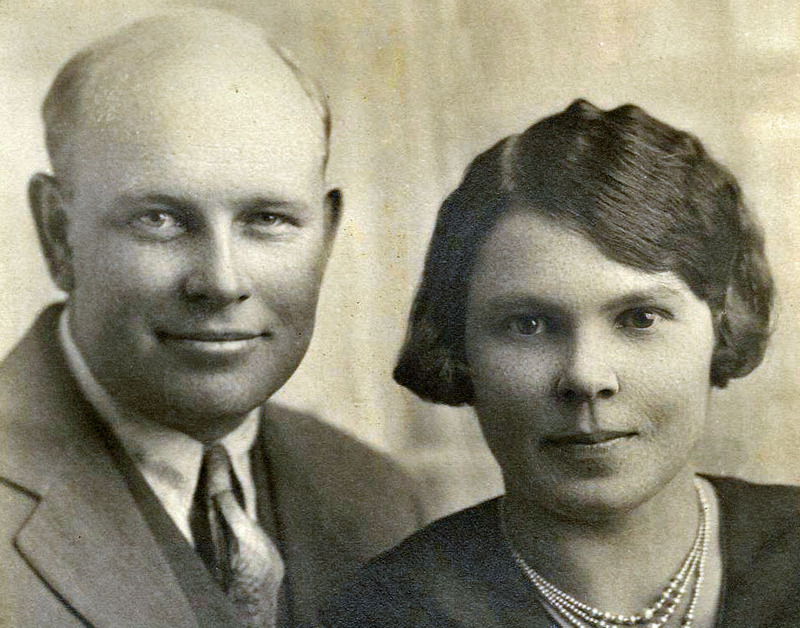 Oliver Smith’s wife was Mazie Swise Smith. Grandpa Elzie’s mother was Dolly Swise Chenoweth. Mazie and Dollie were sisters, however, Oliver was the same age as Grandpa Elzie — Dollie’s son. My grandparents purchased a farm near Macomb using the good word of the Table Grove, IL bank and the promise of the federal government to later pay them for the land. In 1968, Grandpa and Grandma retired and moved into the city of Macomb to live — some 25 years after having to leave the original farm. The most important part of this story was one I lived – it was the example my grandparents gave us. Grandpa Elzie died at the age of 88; Grandma died at 93. In all the years I had shared with them (25 with Grandpa and 34 with Grandma), I never once heard them speak with anger or bitterness over having lost the farm to the government. This was war time — World War II. Their cousins and neighbors were losing sons. They would lose their hired man in France several days after D Day. I distinctly remember Grandma saying they felt it was their duty to help in the war effort by giving up the land. Through their example of patriotism and sacrifice, I consider this the way my grandparents served in the military. On this Memorial Day Weekend, please remember those who have served our country whether it be in uniform or in support of those in uniform. God Bless America. The Patriot’s blood is the seed of Freedom’s Tree. Thomas Campbell.